Stable microwave path alignment: Alcatel-Lucent relies on LMS holding large microwave antenna deployments. LMS engineering: Trailer designers ensure generators and fuel tanks mounted trailers are not going to cause hazardous overloading tongue weight displacements. GREAT VIDEO PRODUCED BY MDS AND OUR IT DEPARTMENT. Good job and keep america safe. Landa Mobile Towers on the launch pads play a key element in helping keep the world safe and utilized on launches for space exploration. When its critical for an un-guyed high wind tower to withstand and remain stable when critical. MDS called our office explaining the launch and how the tower had no movement and sustained no damage.. Great news and we look forward to providing more services in the future, whereas we are assured of growth and confidence in our products. Its great to see our units reported in showing deployment and the venue attached. With the large groups our reliable mobile units pick up the traffic. THE LANDA MOBILE SYSTEMS REMOTE DATA & CELLULAR SOLUTION IS THE FIRST OF ITS KIND IN THE USA AND CANADA. The Landa mobile systems remote data & cellular solution provides a 3×3 redundancy for your remote connectivity needs. The centerpiece of the solutions is a private Cellular LTE and 3G Metro cell unit with authentication for the use of only your devices “AT&T only”. We also can configure for any carrier. This solution can provide up to 25mb x 3 mb of internet access using the new gen-5 satellite and up to 4 dishes can be setup for a combined bandwidth of up to 100mb x 12 mb of internet service. The solution also provides a high-powered Wi-Fi backup solution that offers four 90° sectors antennas with 2 watt radios per antenna. The final part of the solution is a high-powered cellular repeater with Yagi antennas to act as a back haul to connect to a cell towers up to 25 miles away to provide service locally. All the solutions can run simultaneously with auto fail-over and can be deployed in a matter of minutes. This is a true remote data solution for all your data and voice needs, for those true remote deployments this solution can also be outfit with solar power as well. Added cradle point with AT&T and Verizon. No monthly service fees with carrier. Currently deployed at the Louisiana state fair 2017. Setup in 20 minutes and on the air. We can also configure the unit with 4 solar panels built in for full operations with no generator. Landa Mobile Systems is proud to be the backbone of the added communications for the 2017 NY Marathon providing added security with increased mobile, data WiFi and more. Units setup and deployment managed by Hammel Electric. OPERATION CONVERGENT RESPONSE CREATED BY VERIZON TO DEMONSTRATE THE INNOVATIVE NEW TECHNOLOGIES SELECTING LANDA MOBILE SYSTEMS. Towers to support first responders during disaster preparedness training. The carrier has relied on support from other sectors of the tower industry to accelerate the development of the project. Lendlease, one of the world’s largest property, infrastructure and construction management firms, participated in the project at the Guardians Center of Georgia, by installing and operating a temporary communications tower. Verizon and its technology partners then launched a fully automated drone from a drone box, deployed a drone detection system and maintained a 360-degree live feed camera attached to the tower to support first responders during training simulations ranging from man-made to natural disasters. May 30, 2017 – Ground-based Midcourse Defense The U.S. Missile Defense Agency, in cooperation with the U.S. Air Force 30th Space Wing, the Joint Functional Component Command for Integrated Missile Defense and U.S. Northern Command, today successfully intercepted an intercontinental ballistic missile target during a test of the Ground-based Midcourse Defense (GMD) element of the nation’s ballistic missile defense system. Landa mobile systems towers were critical part of this deployment intercept program. UNITED STATES POSTAL INSPECTOR SERVICES UTILIZING THE DISCOUNT ADVANTAGE GSA SELECTED LANDA MOBILE SYSTEMS LLC TO SUPPLY MOBILE TOWERS. AT&T HAS COMMITTED TO HAVING 700 DEPLOYABLES AVAILABLE NATIONALLY FOR FIRSTNET. We hope to be their supplier here in the USA, whereas we have never had a blow over in the history of our company. 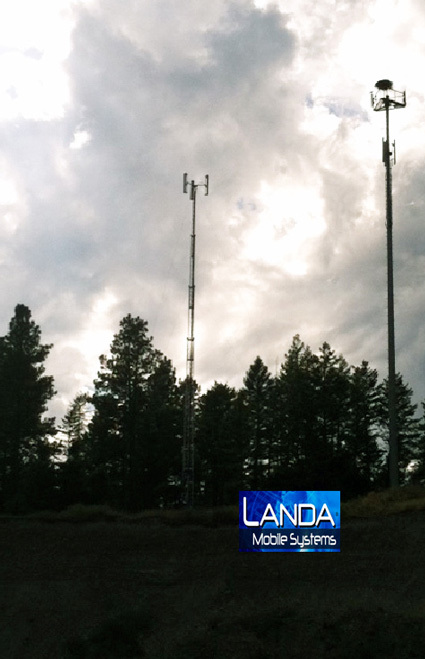 Landa Mobile Systems have been being deployed without fail for 5 years plus with AT&T. LMS OUTRIGGER NEEDLE BEARING OUTRIGGERS. Greatly reduce the effort when deploying outriggers to a minimum. THIS HAS BEEN ONE OF OUR REAL SUCCESS STORIES AS THE TIHS TOWER HAS BEEN UP FOR 4 YEARS STRAIGHT IN CALDWELL, NJ WITH OUT A HITCH. The tower was loaded with 6ea 6′ x 1′ cell panel antennas fed with 12 runs of 1 5/8″ heliax. A total load combined weight exceeding 2000 lbs. The towers looks to be in excellent shape and will need an inspection before its next deployment. There have been many storm in the area in the past 4 years and nothing has affected this towers performance. It engineered loading is 95 MPH with 1/2″ ice in its current configuration. No manufacturer in the Americas comes close to the height and loading Landa can provide. We are now reaching mobile heights of 155′. Lendlease acquires tower and deployed for Verizon tests, original buyer took a 15k hit for 4 years use. It pays in the long run to buy the best. EXCITED TODAY SHIPPING OUT OUR NEW LMS 111 HD. 111′ MOBILE TOWER. Towers going to a “classified configuration deployment location”. This unit will bring critical communications into the arena. We have added an additional 5′ and our Starr Mount for microwave placement among other antennas. There is nothing built in the Americas that can compare to the height, loading ability and high wind load rating capacity. These two units are the beginning of many. We are heading in the right direction. Delivery to a “classified configuration deployment and location”. This unit will bring critical communications into the arena. We have added an additional 5′ and our Starr Mount for microwave placement among other antennas. There is nothing built in the Americas that can compare to the height, loading ability and high wind load rating capacity. LMS 106 HW PORTABLE TOWERS, EYES ON SITE (EOS) UTILIZES LiDAR TO CAPTURE EXISTING CONDITIONS WITH EXACTING PRECISION. LiDAR (light detection and ranging) utilizes optical remote sensing devices (laser scanners) that emit hundreds of thousands of laser pulses per second and then measures how long it takes those pulses to return from surrounding objects. The measured time is converted to distance to create 3D points that in turned are used to create highly precise 3D digital terrain surface models. points cover the project site with point spacing (space between acquired points) well less than one inch. This data density provides the greatest clarity for data accuracies in measuring stockpile volumes, creating digital elevations models (DEM’s) or digital terrain models (DTM’s). For project sites like quarries, asphalt plants or ready mix concrete yards LiDAR sensors and cameras are positioned on mobile or stationary towers ranging in height from 50 to 100 feet tall (dependent on site conditions) to capture details more quickly and safely than traditional surveys methods or UAV flyovers, with no disruption to site operations, providing data (volumetric results) at any time site information is needed. T-MOBILE LMS 150 HD 150′ MOBILE TOWER BEING REMOVED AFTER 4 YEARS. This has been one of our real success stories as the this tower has been up for 4 years straight in Caldwell, NJ without a hitch. The tower was loaded with 6ea 6′ x 1′ cell panel antennas fed with 12 runs of 1 5/8″ heliax. A total load combined weight exceeding 2000 lbs. The towers looks to be in excellent shape and will need an inspection before its next deployment. There have been many storm in the area in the past 4 years and nothing has affected this towers performance. It engineered loading is 95 MPH with 1/2″ ice in its current configuration. No manufacturer in the Americas comes close to the height and loading Landa can provide. We are now reaching mobile heights of 155′. 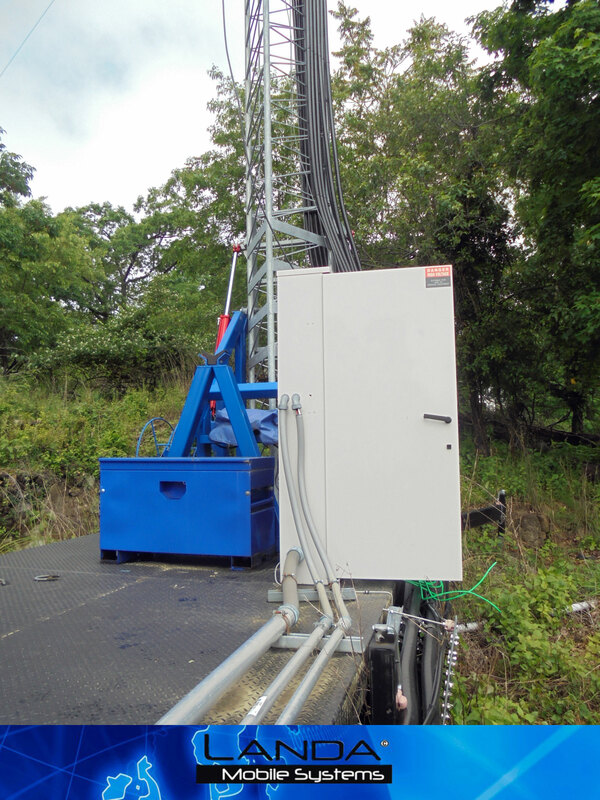 GUAM TELECOM RELIES ON LANDA MOBILE TOWERS FOR ISLAND COMMUNICATIONS. Even with the storms and high winds Landa LMS85 HW withstands the harsh environment of the pacific ocean providing reliable telephone, data and 911. We appreciate the repeat orders and all the years of support. DEPLOYED LANDA MOBILE SYSTEMS LMS 150 HW UNITS INTO BAHRAIN. Our flag ship tower the 150′ unit is deployed in locations worldwide this year. Landa mobile towers bring safety, reliability and extensive loading to a new height in the mobile tower industry. DEPLOYED LANDA MOBILE SYSTEMS LMS 106 HW UNITS GO TO BAHRAIN. We are becoming a prominent fixture on many centers, strategic locations and bases world wide this year with a major expansion. Landa mobile towers bring safety, reliability and extensive loading to a new height in the mobile tower industry. Model LMS106 HW, 106’ units acquired in 2015 by Missile Defense Systems being utilized for Lightning Protection for Missile Defense Systems release this date showing Model LMS106 HW units deployed alongside ICBM units being tested. We have many units out there that are unable to be shown to the public for security. Let us design an application that meets your needs. AT&T WIRELESS BEING PROVIDED INTO REMOTE MOUNTAIN AREAS. When the demand for communications is there LMS120-HD is able to be transported to hilltop areas in remote mountain areas and provide needed communications. Great job of installing and setups securely for many years of dependable service. EYES ON SITE (EOS) UTILIZES LiDAR TO CAPTURE. Existing conditions with exacting precision. LiDAR (light detection and ranging) utilizes optical remote sensing devices (laser scanners) that emit hundreds of thousands of laser pulses per second and then measures how long it takes those pulses to return from surrounding objects. The measured time is converted to distance to create 3D points that in turned are used to create highly precise 3D digital terrain surface models. Accurate 3D field measurements (and video data) are acquired from multiple sensors located around the site creating what’s referred to in the scanning industry as a “point cloud”. Tens of millions of 3D points cover the project site with point spacing (space between acquired points) well less than one inch. This data density provides the greatest clarity for data accuracies in measuring stockpile volumes, creating digital elevations models (DEM’s) or digital terrain models (DTM’s). LMS106 HW 106′ TOWER UNITS DEPLOYED IN MINING AREAS UN-GUYED DEPLOYMENTS AT VARIOUS GRAVEL PITS AND QUARRIES, UTILIZING THE AFOREMENTIONED TECHNOLOGY DETERMINING QUANTITY ON SITE OF MATERIAL i.e. COAL, GRAVEL, ETC. LMS 106 HW 106′ TOWER UNITS DEPLOYED IN MINING AREAS UNGUYED DEPLOYMENTS IN THE USA. LOOKING TO VENTURE THIS TECHNOLOGY WORLD WIDE UTILIZING THE LMS TOWERS AND SAUNDERS. LMS 106 HW 106′ TOWER UNITS DEPLOYED IN UN-GUYED IN CONSTRUCTION AREAS SAFELY DEPLOYED IN POWER LINE ENVIRONMENT IN USA. LMS 106 HW 106′ TOWER UNITS DEPLOYED IN UN-GUYED IN GRAVEL MINING AREAS SAFELY DEPLOYED IN LIVE OPERATING ENVIRONMENT IN USA. LMS 150 HD, 150′ UNITS JAN 2017 ARE UTILIZED BY US MILITARY AGENCIES DEPLOYED WORLD WIDE. DUE TO SENSITIVE NATURE WE NOT POST ANY ACTUAL LIVE DEPLOYMENTS. JUST TRANSPORT. LMS150 HD 150′ TriState TOWERS HAS LMS TOWERS FOR RENT. THEY DELIVER, ENGINEER AND PERFORM FULL TURN KEY TEMP TOWERS TO MEET YOUR NEEDS. THESE UNITS ARE GETTING READY TO GO UP OT THE 150 MARK. Washington County Sheriff Department, MN This high wind multiple large microwave capable tower will lift more load than ever needed and far superior to any portables built. Exceeding most guyed tower loading. After engineering and testing this design proves very reliable, and we are looking to many future deployments where large solid microwave dish placements are necessary and the tower exceeds the wind loading capability of the manufactured dish. an see after two years the undercarriage shows no corrosion as well at the top. These units were given a Mil Spec paint job which we use for salt environment conditions. Another Located on Guam Island in South Pacific high wind (105 MPH) rated and salt water deployment. One of three units we have covering the island where winds are severe. As you can see after two years the undercarriage shows no corrosion as well at the top. These units were given a Mil Spec paint job which we use for salt environment conditions. Located on Meck Island in South Pacific high wind (105 MPH) rated and salt water deployment. Un-guyed AT 85′ tower being used for RF re-radiation on Meck Island. The towers will be used for Lightning protection with the rocket testing in a few weeks. 85′ Located on Meck Island in South Pacific on cliff edge and with high wind (105 MPH) rated and salt water deployment. Un-guyed. The towers will be used for Lightning protection with the rocket testing in a few weeks. LMS106 HW SPRINT UNIT DEPLOYED IN KANSAS. WHERE QUALITY IS PARAMOUNT AND WHEN COMMUNICATIONS IS DEPENDING ON RELIABILITY. LMS 106 HW DEPLOYMENT IN CANADA OWNED BY TBAYTEL, WHERE QUALITY IS PARAMOUNT AND WHEN COMMUNICATIONS IS DEPENDING ON RELIABILITY. LMS 106 HD ONE OF 22 WE MANUFACTURED THAT WERE SHIPPED TO COSTA RICA. THIS ONE DEPLOYED IN GUANACASTE. END USER ORDERED ANOTHER 22 FROM A COMPETITOR TO MEET THERE BUILD OUT DEADLINE. UPON RECEIVING 11 OF THE 22 UNITS AND ALL FAILING TO LIFT THE NEEDED LOAD, THEY CANCELLED THE OTHER 11 NOT RECEIVED ON ORDER. LMS 85 HW CALIFORNIA’S LARGEST UTILITY ENTRUSTS LMS TOWERS UN-GUYED ON GRID SERVING AS PRIMARY BACK BONE IN COMMUNICATION RECOVERY DEPLOYMENTS THROUGHOUT THE STATE. FULL PAN AND TILT MICROWAVE OPERATION. LMS 150 HD 2016 DEPLOYMENT RENTAL FROM ONE OF OUR ASSOCIATES GETTING THE LANDA UNITS OUT ON SHORT NOTICE, WHEN A CARRIER NEEDS THE COVERAGE, IT’S UP IN HOURS, FROM NO CELL TOWER TO FULL SITE. THERE IS NO EXCUSE WHY COVERAGE IS NOT POSSIBLE WITH A LANDA TOWER. LMS106 HW DEPLOYED IN CANADA FOR SEVERAL YEARS NOW, WHERE RELIABILITY IS PARAMOUNT. TOG our rental partner in Alberta HAS DOZENS OF OUR UNITS ON DEPLOYMENT. CONTACT THEM ON OUR RENTAL PAGE FOR CANADIAN DEPLOYMENTS, ALBERTA. LMS 106 HW 2016 OUR NEW DEPLOYMENT IN CANADA, WHERE QUALITY IS PARAMOUNT AND WHEN COMMUNICATIONS ARE DEPENDING ON RELIABILITY 100% LANDA MOBILE UNITS ARE FIRST CHOICE FOR ROUGH ENVIRONMENT THE UNITS WITHSTAND ANYTHING THROWN AT THEM. WITH THE USE IF THE LANDA TOWER YOU WILL BE CONNECTING TO MULTIPLE CELL TOWERS SIMULTANEOUSLY THIS WILL GIVE YOU VERY HIGH REDUNDANCY. THE AMP WILL CONNECT TO ALL PROVIDERS IN MANY INSTANCES. LMS 106 HW 2016 OUR NEW DEPLOYMENT IN CANADA, EQUIPMENT ON TOWER CELL ANTENNAS AS RF RADIO ANTENNAS. PROVIDING CAMP WITH WIRELESS CELL, DATA AND RF RADIO SERVICE. DISTANCE TO CELL TOWER 32 MILES FROM SITE. THIS IS A WIRED AND WIRELESS SOLUTION, SERVICE IS CELL AND DATA. IN THEIR OFFICE THEY HAVE FULL SIGNAL STRENGTH. WHERE EQUALITY IS PARAMOUNT AND WHEN COMMUNICATIONS ARE DEPENDING ON RELIABILITY 100% LANDA MOBILE UNITS ARE THE FIRST CHOICE AND LEASED THROUGH OUR CANADIAN ASSOCIATES. LMS 120 HD 120′ FITTED WITH OUR MICROWAVE STARR MOUNTS SERVING AS MOUNT AND TORQUE ARE GIVING LITTLE TO NO MOVEMENT, TRIPLE AXLE, DECK SLIDE OUT. TOWERS ARE WITH A NATION WIDE CARRIER W/UNITS DEPLOYED IN USA. UNDISCLOSED SITES. LMS 106 HW 2016 OUR NEW DEPLOYMENT IN CANADA, EQUIPPED ON TOWER CELL ANTENNAS AND RF RADIO ANTENNAS. PROVIDING CAMP WITH WIRELESS CELL, DATA AND RF RADIO SERVICE THE AMP IS A COMMERCIAL ALL CARRIER ALL FREQUENCY SOLUTION, IT IS ALREADY LICENSED WITH FCC AND CAN BE USED ANYWHERE IN NORTH AMERICA. IT IS APPROVED BY ALL PROVIDERS YOU DO NOT HAVE TO CONTACT THEM WHEN YOU MOVE FROM SITE TO SITE. REGISTRATION OF THE AMP WILL BE DONE AT TIME OF INSTALL. REGISTRATION IS ONE TIME ONLY. LMS 106 HW 2016 PROVIDING INTERNET BACK HAULS PROVIDING INTERNET AND VOIP SERVICES IN CANADA, COAL MINES. LMS 60 60′ COMPLETE SOLAR SETUP IN OMAN. CREW SETTING UP STAGED AREAS FOR LARGE DEPLOYMENT 2016. LMS150 HD 150′ SWAN INSTALL/ T-MOBILE DEPLOYMENT WITH 6EA 6’X10″, 1EA 2′ MICROWAVE DISH, 12EA 1 5/8″ COAX LINES, RATED 95 MPH. ENGINEERED AND DEPLOYED NJ. 7-2013 INSTALLED AND STILL UP, NO ISSUES TO DATE 2-2016. LMS 85 HW CALIFORNIA UTILITY DEPLOYED AS PRIMARY BACK BONE IN DISASTER EXERCISE. LMS 60 LP OUR 60′ CRANK-UP LOW PROFILE HIGH WIND RESISTANT TOWER GOOD FOR 110 MPH. USED HERE IN OIL AND GAS PIPELINE CANMPS. WI-FI BATTER AND WIND POWERED. LMS 120 HD 120′ AT&T WITH 3EA 6′ x 101″ PANELS WITH 1 5/8″ LINES ENGINEERED AND DEPLOYED. LMS 106 HD NEW DEPLOYMENT IN MANITOBA CANADA, EQUIPMENT ON TOWER CELL ANTENNAS AND RF RADIO ANTENNAS. PROVIDING CAMP WITH WIRELESS CELL, DATA AND F RADIO SERVICE. 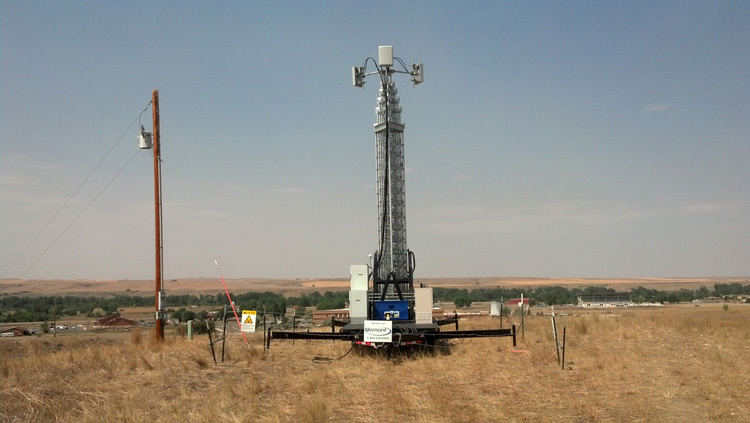 LMS 106 HW ANCHOR ELECTRIC LEASE TO VERIZON DEPLOYMENT IN WYOMING. LMS 106 HW #2 ANCHOR ELECTRIC LEASED TO VERIZON DEPLOYMENT IN WYOMING. LMS 106 HW ANCHOR ELECTRIC LEASED TO VERIZON DEPLOYMENT IN WYOMING. LMS 25 TT 25′ TRAINING TOWER. IBEW TRAINING TOWER. LMS 120 HD 120′ FITTED WITH OUR MICROWAVE STARR MOUNTS SERVING AS MOUNT AND TORQUE ARM GIVING LITTLE TO NO MOVEMENT, TRIPLE AXLE, DECK SLIDE OUT. TOWERS ARE WITH NATION WIDE CARRIER W/UNITS DEPLOYED IN USA. UNDISCLOSED SITES. LMS 120 HD 120′ FITTED WITH OUR MICROWAVE STARR MOUNTS SERVING AS MOUNT AND TORQUE ARM GIVING LITTLE TO NO MOVEMENT, TRIPLE AXLES, DECK SLIDE OUT. TOWERS ARE WITH A NATION WIDE CARRIER W/ UNITS DEPLOYED IN USA. UNDISCLOSED SITES. LMS 85 HW 85′ CUSTOM BUILT, SPREAD 8,000 LB AXLES, GENERATOR, MICROWAVE PAN AND TILT, ELECTRIC TONGUE JACK, CABINETS, GROUNDING FOR CALIFORNIA UTILITY, AND PERFORMING GREAT. UNITS HAVE BEEN DEPLOYED IN SEVERAL EMERGENCY DISASTERS AND NEW ORDERS IN FOR 2016. LMS 106 HD TBAYTEL OUR NEW DEPLOYMNET IN CANADA, EQUIPMENT ON TOWER CELL ANTENNAS AND RF RADIO ANTENNAS. PROVIDING CAMP WITH WIRELESS CELL, DATA AND RF RADIO SERVICE. LMS 60, 60′ CRANK-UP TOWERS FILL THE COMMUNICATION NEEDS BETWEEN CAMPS, PIPELINE, DATA CENTERS FOR SOLID COMMUNICATIONS PLATFORM. LMS 60 LP OUR CRANK-UP LOW PROFILE HIGH WIND RESISTANT TOWER FOOD FOR 110 MPH. USED HERE IN OIL AND GAS PIPELINE CAMPS. WI-FI BATTERY AND WIND POWERED. LANDA HAS HUNDREDS OF THESE UNITS NOW DEPLOYED IN CANADA AND USA. NEVER A FAILURE. LMS 106 HW 106′ 2012 SPRINT DEPLOYED DOWNTOWN KANSAS CITY. LMS 106 HW 106′ HEADING TO JOIN THE MANY UNITS DEPLOYED IN ALBERTA, CANADA FOR LEASE OPERATIONS WITH TOG. LMS 60 LP UNITS DEPLOYED OIL FIELDS ND. LMS 106 HW 106′ WHEN CELLULAR AND DATA ARE DEMANDED. LMS 150 HD 150′ DEPLOYMENT WITH 3EA 6’ x 10″ FEED, 1 5/8″ COAX LINES, RATED 95 MPH. ENGINEERED AND DEPLOYMENT MT. LMS 150 HD BEING DEPLOYED OUT IN THE COUNTRY, SUPPLYING NEEDED CELLULAR AND DATA. LMS 85′ HW 85′ RATED AT 90MPH UN-GUYED, HYDRAULIC OUTRIGGERS, 360 PAN AND TILT W/REMOTE, GENERATOR, CABINET, SAFETY RAIL SYSTEM, DUAL REELS, JACK SHOES, ELECTRIC JACK, 16 PLY TIRES. LMS 106′ HW RATED AT 85 MPH UN-GUYED. LMS 150′ HD 150′ DEPLOYED ON A RENTAL WHILE THE WATER TOWER IS BEING SERVICED. LMS 106 HW DEPLOYMENT IN CANADA, EQUIPMENT ON TOWER CELL ANTENNAS AND RF RADIO ANTENNAS. PROVIDING CAMP WITH WIRELESS CELL, DATA AND RF RADIO SERVICE. LMS 106 HD TBAYTEL DEPLOYMENT IN CANADA, EQUIPMENT ON TOWER CELL ANTENNAS AND RF RADIO ANTENNA. PROVIDING CELLULAR, DATA AND RF RADIO SERVICE. LMS 106 HW 2016 OUR NEW DEPLOYMENT IN CANADA, EQUIPMENT ON TOWER CELL ANTENNAS AND RF RADIO ANTENNAS. PROVIDING CAMP WITH WIRELESS CELL, DATA AND RF RADIO SERVICE. LMS 106′ HW PURDUE UNIVERSITY TAKES DELIVERY OF A SOLAR REMOTE UNIT FOR DEPLOYMENT TESTING IN THE COLORADO MOUNTAINS. LMS 150 HD DEPLOYED OUT IN THE COUNTRY, SUPPLYING NEEDED CELLULAR DATA. LMS 106 PT 106′ AT&T ANNOUNCED THE DEPLOYMENT OF TWO “SUPER” CELL SITES- A “SUPER” COLT (CELL ON LIGHT TRUCK), A “SUPER” COW (CELL ON WHEELS) USA. LMS 60 WITH 12′ EXTENSIONS WE HAVE HUNDREDS OF THESE 60′ UNITS DEPLOYED AND LEASED OIL DRILLING CAMPS IN ALBERTA CANADA. LMS 106 HD NEW DEPLOYMENT IN MANITOBA CANADA, EQUIPMENT ON TOWER CELL ANTENNAS AND RF RADIO ANTENNAS. PROVIDING CAMP WITH WIRELESS CELL, DATA AND RF RADIO SERVICE. LMS 120 HD 120′ AT&T/ WITH 3EA 6′ x 101″ PANELS WITH 1 5/8″ LINES ENGINEERED AND DEPLOYED IN MD. LMS 120 HD 120′ AT&T WITH 3EA 6′ x 101″ PANELS WITH 1 5/8″ LINES ENGINEERED AND DEPLOYED IN NH. LMS 120 HD AT&T 120′ AT&T/ WITH 3EA 6′ x 101″ PANELS WITH 1 5/8″ LINES ENGINEERED AND DEPLOYED IN NH. LMS 120 HD AT&T 120′ WITH 3EA 6′ x 101″ PANELS WITH 1 5/8″ LINES ENGINEERED AND DEPLOYED IN NH. 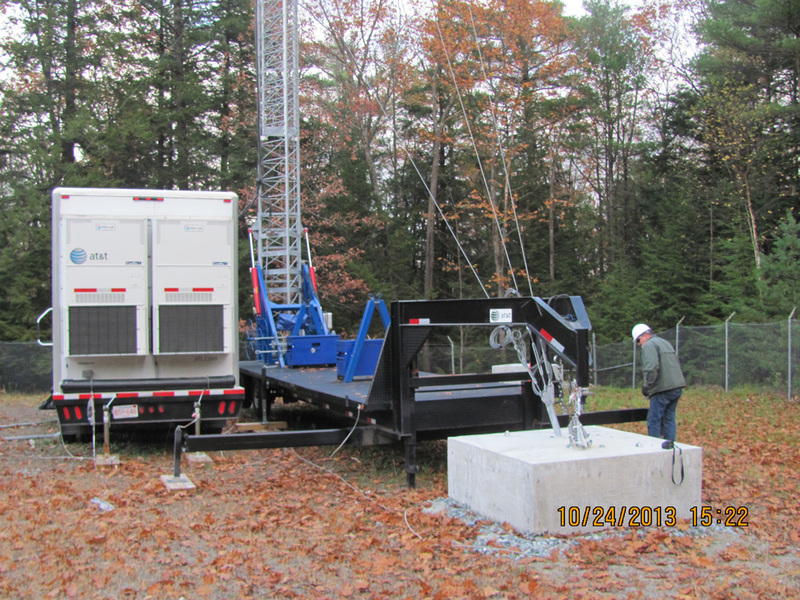 LMS 106 HW 106′ AT&T WITH 3EA 6′ x 101″ PANELS WITH 1 5/8″ LINES ENGINEERED AND DEPLOYED IN NH. LMS 120 HD 120′ AT&T WITH 3ea 6′ x 101″ PANELS WITH 1 5/8″ LINES. LMS 106 HW T&T DEPLOYED IN HUDSON HOPE, BRITISH COLUMBIA, CANADA. LMS 60 WIRELESS HEADING NORTH TO DRILLING CAMPS IN ALBERTA, CANADA. LMS 150 HD 150′ SWAN INSTALL/ T-MOBILE DEPLOYMENT WITH 6EA 6’ x 10″, 1EA 2′ MICROWAVE DISH, 12EA 1 5/8″ COAX LINES, RATED 95 MPH. ENGINEERED AND DEPLOYED IN NJ AFTER HURRICANE SANDY. 7-2013 INSTALLED AND STILL UP, NO ISSUES AND THERE HAS BEEN SOME SEVERE WEATHER AND WINDS TO DATE 2-2016. LMS 106 HW 106′ VERIZON/ANCHOR ELECTRIC, WITH 3EA 6′ x 101″ CELL ANTENNA, WITH 6 EA 1 5/8″ FEED LINES. ENGINEERED AND DEPLOYED BROADVIEW, MT 7-2013. LMS 106 HW 106′ VERIZON/ANCHOR ELECTRIC, WITH 3EA 6′ x 101″ CELL ANTENNAS, WITH 6 EA 1 5/8″ FEED LINES. ENGINEERED AND DEPLOYED MT. LMS 106 HD TOW, 106′ USN, UNITED STATES GOVERNMENT RELIES ON LMS TO GET IT UP WHEN NEEDED, CONFIDENTIAL ENGINEERED DEPLOYMENT AFRICA. LMS 150 HD 150′ DEPLOYED T-MOBILE. LMS 120 HD 120′ BEING DEPLOYED AT&T NH. LMS 150 HD 150′ FULTON / AT&T WITH 3EA 6′ x 101″ PANELS WITH 1 5/8″ LINES ENGINEERED AND DEPLOYED. LMS 50, 50′ CRANK-UP TOWERS EXTENDABLE TO 62′ TOWERS FILL THE COMMUNICATION NEEDS BETWEEN CAMPS, PIPELINE, DATA CENTERS FOR SOLID COMMUNICATIONS PLATFORM. LMS 60, 60′ CRANK-UP TOWERS EXTENDABLE WITH EXTENSION TO 72′, FILL THE COMMUNICATION NEEDS BETWEEN CAMPS, PIPELINE, DATA CENTERS FOR SOLID COMMUNICATIONS PLATFORM. LMS 106, 106′ KRS DEPLOYMENT MISSILE DEFENSE. LMS 106 HW DEPLOYMENT IN CANADA, EQUIPMENT ON TOWER CELL ANTENNAS AND RF RADIO ANTENNAS. PROVIDING CAMP WITH WIRELESS CELL, DATA, AND RF RADIO SERVICE. LMS 106 HW DEPLOYMENT TESTING FIRE WATCH PROGRAM. AFTER TESTING OUR COMPETITION IT. 106′ UNIT WHICH FAILED THEIR STABILITY TESTING TO EXCESSIVE MOVEMENT ANOMALIES, LMS TOWERS PASSED OUT OF 200 TESTS WITH ONE ANOMALIES. LMS 106 HW 106′ UNITS, UNDISCLOSED TRANSPORT. LMS 150 HD 150′ 106′ UNITS, UNDISCLOSED TRANSPORT, MIDDLE EAST POWER CONFIGURATION. CERTIFIED Green All tower construction and trailer steel is manufactured 100% from USA recycled steel.